Last month I went on my sunny summer holiday to Jamaica, and of course I spent the weeks leading up to our departure date preparing for it! 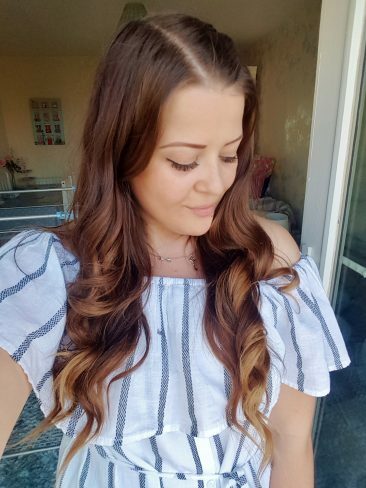 I meticulously planned everything from the outfits I’d need, the beauty treatments I wanted to book, and the general packing I had to sort out before we left. 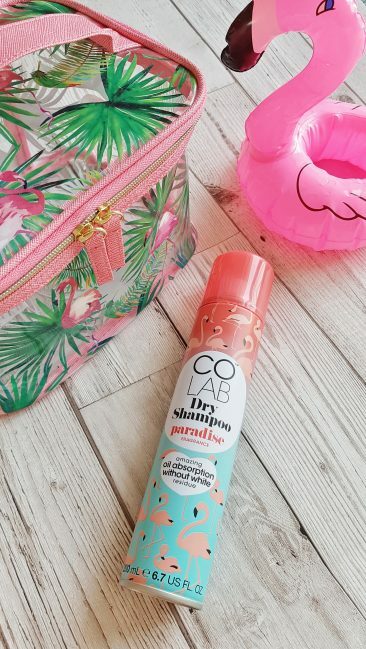 So here’s a little breakdown of how I prepared for my holiday and my summer holiday essentials.. including my new phone which stayed on for a whole week without being charged! Before we set off I wanted to make sure I looked my best, so I booked in for a few beauty treatments so I was sure I’d be feeling great for my trip! 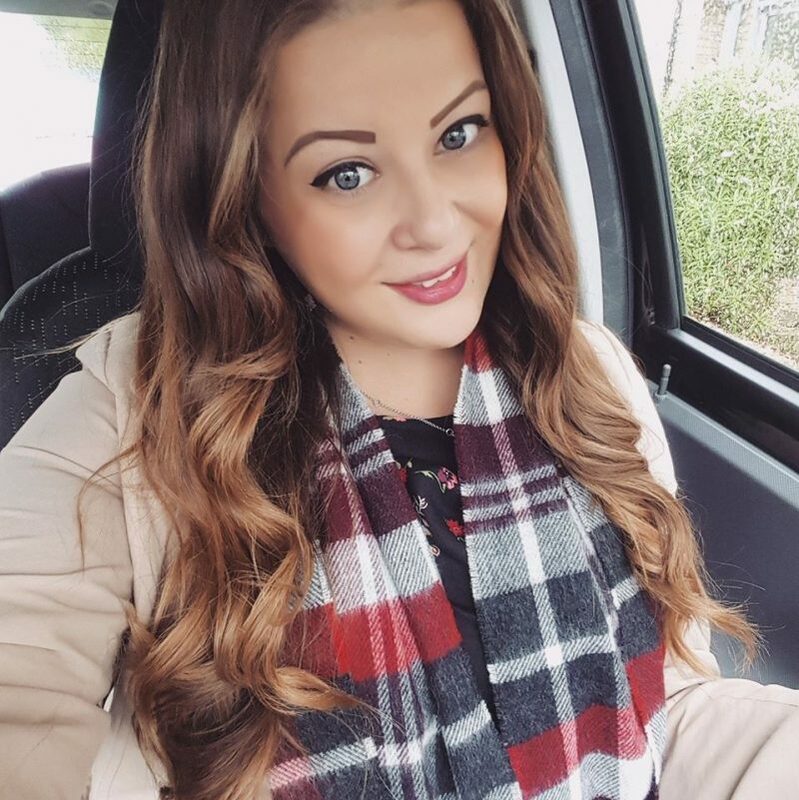 Firstly I grew out my nails and booked in to get gel nails done with Bluebell Nails, a local nail lady that lives near to me in Milton Keynes. 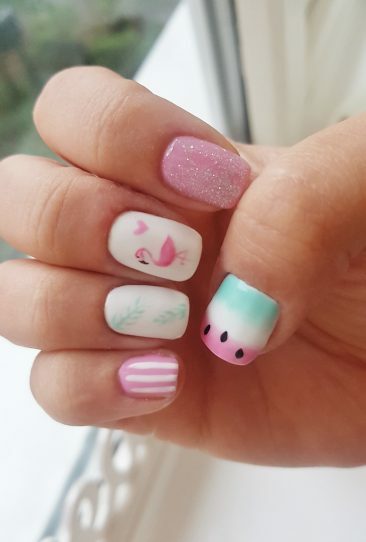 I wanted to get full on ‘holiday nails’ so I asked for some tropical nail art with two of my favourite things.. flamingos and watermelons! Amazingly the nail art was totally done by hand and I was so amazed by the tiny flamingo! The nails lasted for 4 weeks and I kinda miss my little flamingo now.. I also booked in to get eyelash extensions done a few days before my holiday, which are a must have for sunny holidays. Whenever I’m away, putting make up on is the last thing I want to be doing. Having lash extensions makes getting ready so much easier and quicker, and I love the effortless natural look they give. 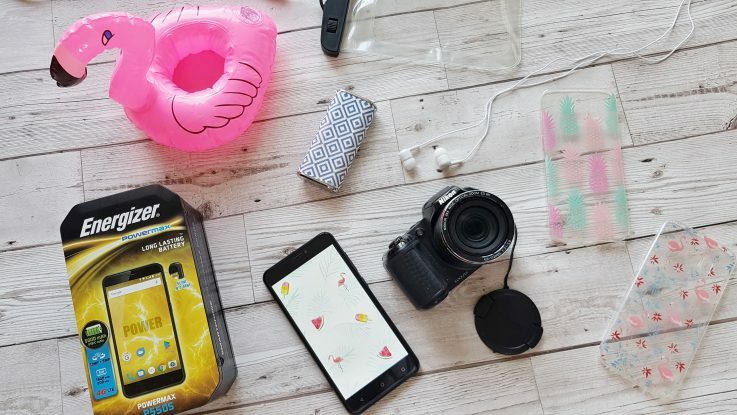 Holiday must haves in the technology department include a waterproof phone case, headphones, your camera, and of course, your mobile phone. In preparation for my holiday I was lucky enough to be offered an Energizer POWERMAX P550S phone to try out! The phone is produced by Energizer, as in the company that manufacture batteries and have the cute Energizer bunny! Designed for maximum performance, with the POWER MAX P500S 5000 mAh battery, you can communicate, surf, play, and watch videos for hours without recharging. Thanks to Intelligent Power Saving technology, every milliampere of the battery is optimised to avoid waste. 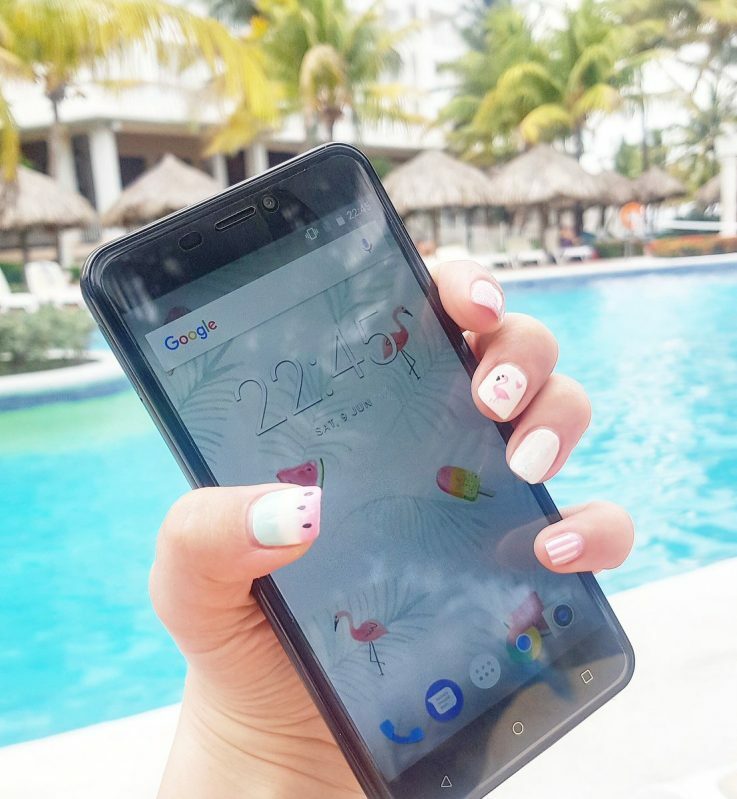 The phone has loads of clever features, such as its fingerprint reader which you can use to you can unlock the phone with a single touch in less than a second, and best of all, the hugely powerful 5000 mAh battery which makes it one of the most powerful smartphones available. Thanks to the Intelligent Power Saving technology, a pre-set energy saving mode for optimising every milliamp of the battery, it has a record-breaking battery life. I found the battery life to be absolutely outstanding, as I used it non stop on holiday for taking photos and listening to music on Spotify (including the duration of a 10 hour flight) and it still had plenty of battery left.. I didn’t have to charge it up once! If you’re looking for an affordable Android smartphone which boasts a huge battery, solid design with a full metal body and large bright screen, I’d suggest checking out the range of Energizer mobiles. The phone would be perfect to take to festivals when you can’t get access to a charging point! I took a few different bags with me on holiday, because every outfit needs a matching bag, right?! I took two big beach bags which are so essential for summer holidays. The bigger the better! 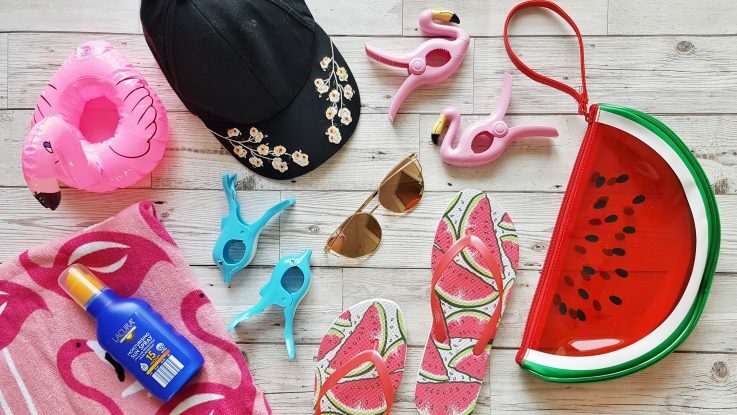 They’re perfect for keeping your beach towels, sun cream, and pool inflatables in. 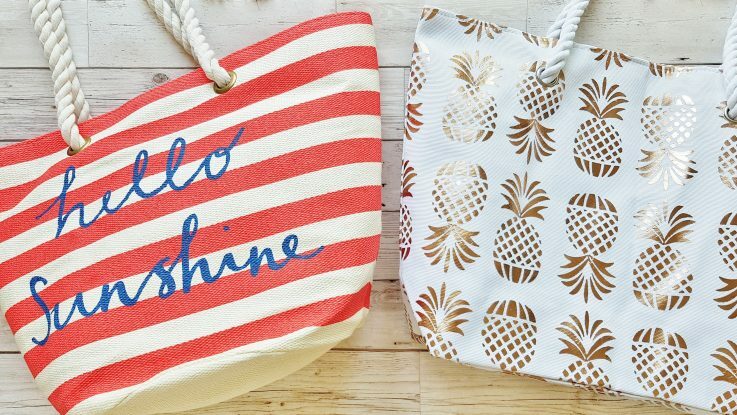 The white pineapple print beach bag is from South beach and the coral striped one is from Joules. 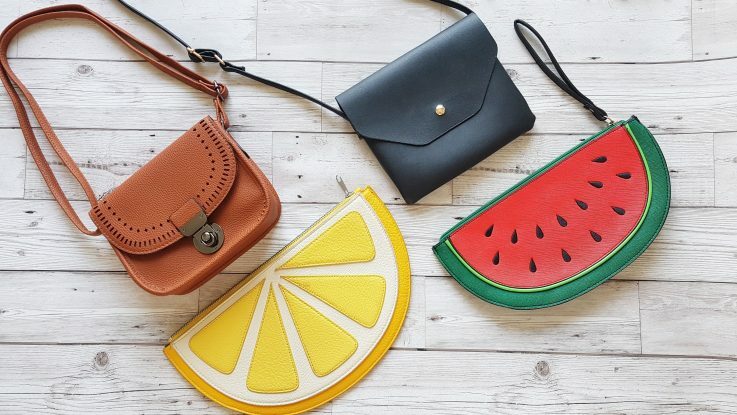 I also took a couple of shoulder bags for everyday use just for keeping my room key, sunglasses and phone in, and some fruity clutch bags to use in the evenings. I bought the clutch bags a few years ago but I still use them every holiday! You can get similar ones on eBay or there’s a beaded watermelon one in Matalan. These two bikinis are only a very small portion of my swimwear collection! I am absolutely obsessed with buying cute bikinis every summer. I have so many I could probably wear a different every day on a two week holiday. These two are my most recent additions. I wasn’t feeling 100% body confident before I went away, so I wanted bikinis that had a little more coverage. I fell in love with these high waisted bikinis with long-line tops so they cover up any belly and back fat situation. I found the pretty floral print red one in Peacocks and the tropical one from a Chinese seller on Ali Express. I treated myself to some new summer holiday basics this year too. I wanted a cap I could wear by the pool but a nice girlie one. I found this black cap on Ali Express with pretty pink floral embroidery that was just perfect and a bargain at only £2.27! Ali Express is basically my favourite place to shop (in case you hadn’t already noticed!) and I also bought some of my other holiday accessories from there. If you ever order anything from Ali Express, be aware that it comes from China so delivery can take anything from 2 – 6 weeks, so order well in advance! So as I was saying.. I also ordered these rose gold sunglasses and inflatable flamingo cup holder from Ali Express. I thought the cup holder was just going to be a novelty thing, but it was actually surprisingly useful to have in the pool. And it was only 69p including delivery, and £2 for the sunglasses! On the topic of flamingos, I bought the pretty pink beach towel for only £5 from Asda, and the flamingo beach towel clips I picked up for £2 in Poundworld, but they’re also available in Matalan. I don’t know how I ever managed a pool holiday without these towel clips before, they are so useful! They keep your beach towel secure on your sun bed so that it doesn’t keep blowing around or sliding down. So practical! Also.. if you’re looking for cheap sun cream, Aldi is the place to go. I’ve made the mistake in the past of taking loads of pairs of shoes away on holiday with me; heels, wedges, and a million pairs of sandals. But realistically, shoes take up loads of space and weight in luggage and I only ever wear a couple of the pairs that I take. 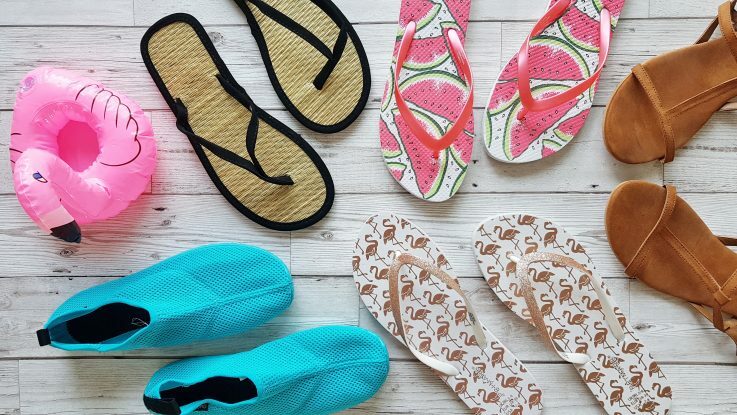 So this year I decided just to take a few pairs of flip slops with me, because that’s all I really need for a holiday where I’ll just be sitting by the pool or walking along the beach. I also took a pair of more ‘heavy duty’ sandals which I wore on the plane so they didn’t take up luggage weight. As we were planning to climb some waterfalls on our holiday I also packed some beach shoes, which are hideous but surprisingly comfy! If you ever need any water shoes for any reason, get them from Decathlon where they’re only £5. I tried not to take too many outfits either, and as I was packing I tried to minimise the amount of stuff I took. I picked outfits for the daytime and some for the evenings, and made sure that I wasn’t taking more than I needed. Before I went away I did a fair amount of holiday shopping and bought some gorgeous dresses and playsuits! In the photo below, I got the pineapple print playsuit for £6 from Primark (bargain! 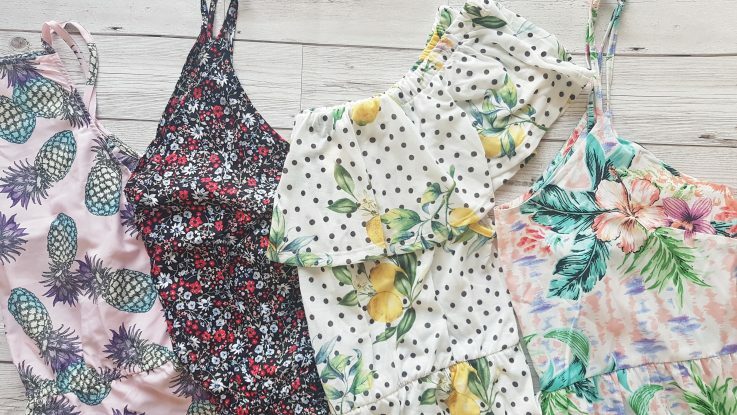 ), the black floral playsuit was £12 from H&M, the lemon print dress (my fav) was reduced to £12.50 from ASOS, and the tropical beach dress was also £6 from Primark. This cute flamingo outfit I bought from George at Asda! It was probably my favourite holiday outfit and the shorts were only £10 and the vest £5. It was perfect to wear as a casual evening outfit for dinner. 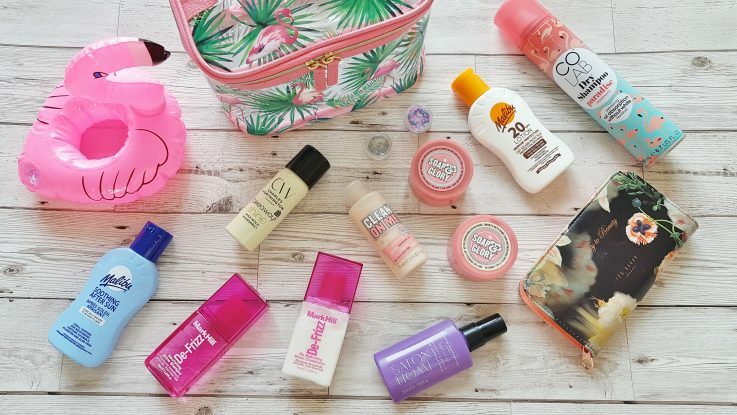 And finally… here’s what I packed away in my hand luggage! 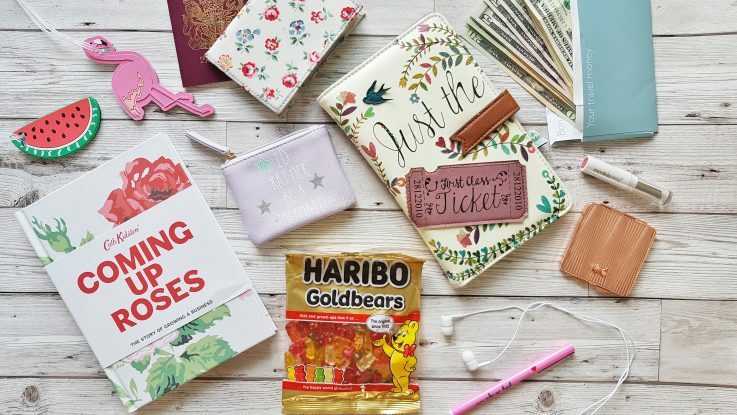 I used a large tote bag as my airport hand luggage and packed all the pre-flight essentials such as money, passports, purse, a book, and of course.. sweets! I love all the watermelon and flamingos! And your nails are so cute!